Incredible likeness of Dan Aykroyd as Dr. Raymond Stantz. Remarkably realistic statue stands 19-inches tall on a Ghostbusters base! Bearing an incredible likeness of the inimitable Dan Aykroyd as Dr. Raymond Stantz, this remarkably realistic statue stands about 19-inches tall on its Ghostbustersthemed base. In a classic pose, Ray has his neutrona wand in hand and an intricately detailed proton pack. 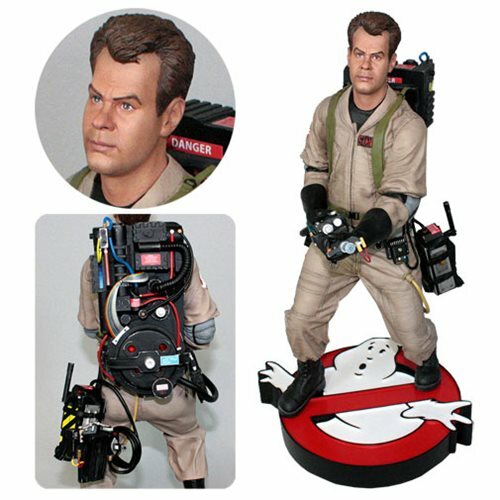 The museum-quality Ghostbusters Ray Stantz 1:4 Scale Statue is constructed from heavyweight polystone and then hand painted in fine detail. It's a limited edition of just 1,000 pieces worldwide! Ages 14 and up.